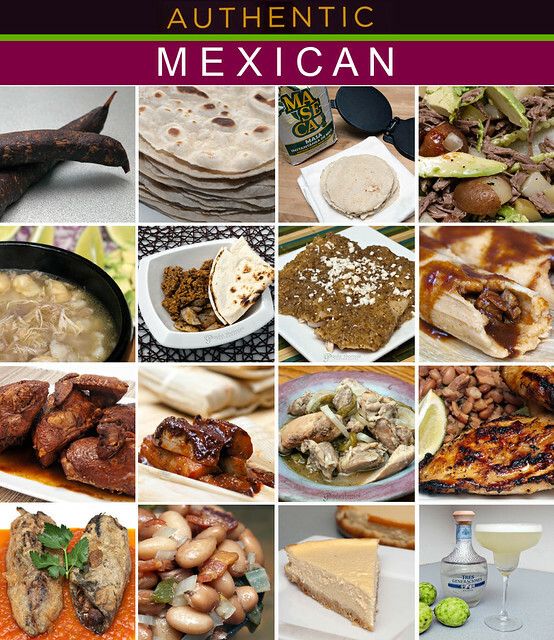 I've completed my Authentic Mexican Cookbook by Rick Bayless review project after 15 blog posts and 16 recipes, not counting sauces, condiments and marinades. I have to admit I'm pretty glad it's over. This project has been the most difficult of the cookbook projects I've done so far. The recipes weren't really hard but almost every one was very time consuming, taking many hours to prepare. I got this cookbook from my mom for Christmas which was on my Amazon wishlist. Her side of my family is Mexican so I dedicate this project to my mom. Maybe one day I will get a Danish or Scandinavian cookbook for my dad's side of the family. I made at least one recipe from each category of the cookbook for the project. I didn't think I would have too much trouble finding ingredients since there are several Mexican stores nearby that I thought would have everything I might need. Unfortunately I was wrong. There were several peppers that were difficult to find, some of them being seasonal peppers that were no where to be found. He did a pretty good job at suggesting alternate ingredients but sometimes even the alternate ingredients couldn't be found. Google came in handy to look up a few things that I couldn't find to get some ideas of other things I could use as a substitute. There was one ingredient called ashoshoco leaves called for in the pozole recipe that I have no idea what it is and Google wasn't even helpful. I'm not sure if it's spelled wrong or what but I couldn't find any info on it. I also found some of the recipes difficult to follow because they referenced other recipes in the cookbook in order to complete. Mainly for sauces and marinades but sometimes several steps within the recipe were referred to like in the mole rojo con pollo recipe which turned out to be most confusing because peanuts were used in the referred to recipe but almonds were in the ingredient list of the mole rojo con pollo recipe. I ended up not using peanuts or almonds in the dish because I wasn't sure where to use them since none of the instructions said to add the almonds. There were a couple of times where I completely forgot an ingredient, usually it was in the garnish so it wasn't too big of a deal. It's pretty easy to miss something when the recipe directions are so long. You really have to read through them a couple times before you even start to make sure you understand and are prepared for it. I did find the Cook's notes sections of the recipes very helpful. There he lists some alternate ingredients as well as some ingredient descriptions. There are notes on the timing and how long the recipes take but I found the timing to be off. Most of the time they took longer than what was listed there so if you make any of these recipes make sure you start them early.